So let’s see… Salah opened up the scoring in the 19th, largely due to the super swift young defender we like to call Alex. Then El Shaarawy scored in the 59th, thanks to Galliani’s gift to Roma, who climbed to third place after receiving said gift in January. And of course, the Little Pharaoh didn’t celebrate, we knew he was too classy for that. His sub, Emerson, came on and then scored the third goal in the 82nd, 3-0 Roma. They had 65% possession, too. 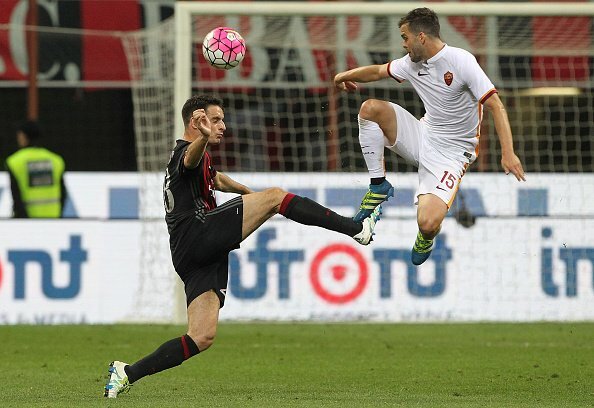 And that was even without Montolivo to pass it to Roma. You see, our fearless captain had a couple of rough nights because his wife just gave birth to a little girl. Waaah. Cry me a river. Antonelli played and actually scored an amazing bicycle kick goal about 24 hours after his wife gave birth, and Brocchi said he had the same issues. Didn’t miss training like Princess Montolivo, either. Not that her majesty was missed for even one second tonight. I have actually given birth and never flaked on my commitments postpartum. In fact, I never slept through even one night for eight years after my son was born between both of my kids, and I always showed up and did everything I was asked to. I swear on my life, he is the most entitled, worthless, incompetent player I have ever known of. The fact that he has worn Milan’s armband so many times is a more true testament to Milan’s clear and utter failings these past years than anything else I know of. Yes, Roma were that dominant. For our part, Balotelli and Honda provided the most chances in the first half. But apparently, trying so hard to score was the “wrong attitude” for Silvio Brocchi, so Balotelli was subbed off for Adriano at the half. Adriano, of course, had the “right attitude” for the Bizarro World coach(es,) but not as much talent and thus not as many opportunities. It is also of note that Bacca only had five touches on the ball and zero shots in the first half, but apparently, the right attitude. Okay, then. But at least, having been given the full 90 minutes to decide if he wanted to shoot or not, he did finally score a tap in in the 86th. Even though I find the new gold keeper kits a ridiculous and hideous way to promote Milan’s “Golden Boy” keeper, he was almost as good as gold tonight. Despite making a naïve error in picking up the ball from a pass from a teammate in the 61st, his spectacular save on the King of Rome in the 64th will be more permanently etched into my mind than that hideous kit will be. 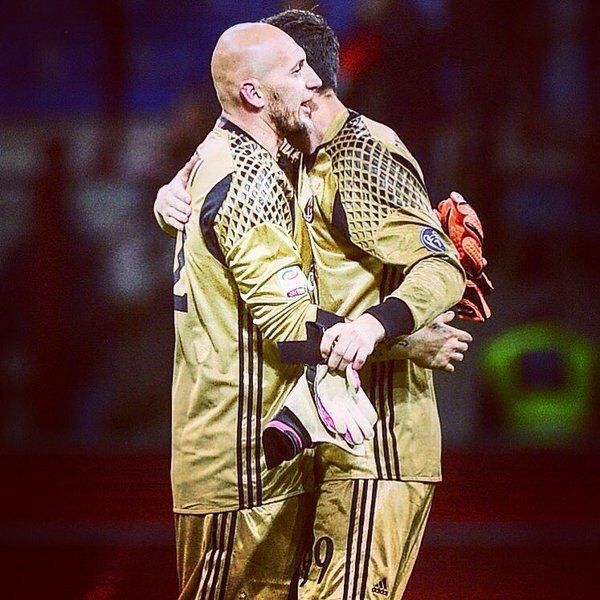 But the big story for me was my boy, Abbiati, saying an emotional goodbye. If you did not at least get choked up inside at the pictures and footage of him saying his farewells, then you are not human. Even the big, bald, and beautiful stalwart of so many years at Milan was tearing up at warmup. At first I thought it was the new keeper kit he was forced to wear. But then I realized that he was in pain having to watch one more match of Brocchi’s Milan. We all suffered for that one, but I cannot blame him for having to watch it up close and personal. Whatever with the scoreline, this part hurt so much worse. But at the end, when he kissed the crest, took his final bows to the Curva, and then presented Donnarumma as the next generation… I completely lost it and was just bawling. I mean it was such a class act, particularly from someone whose captaincy was usurped and announced publicly without his knowledge. And worse that it was given to Montolivo the Usurper™. 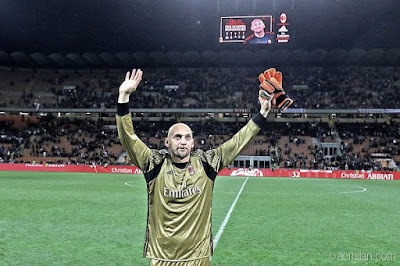 But “Zio”, as his teammates called Abbiati, has always been quiet and classy, and he went out the same way, not playing a single minute in his final league match. All of the years of injuries and being loaned out or pushed aside by other keepers, and he held his head high and gave Milan fans one last dose of Milan class, perhaps the last of the class we’ll see for a while. While I think most Milan fans heaved a sigh of relief at not having to watch any more train wreck league matches until August, everything else is completely up in the air. Who knows who will own and run Milan by then? Who will be the coach next year, current rumors aside? Which players will stay and who will leave? The mystery of our first kits was solved quite unceremoniously, but how horrible will the other kits be for us beleaguered fans? Will the end of days scenario of a Montolivo extension finally happen (if his daughter doesn’t keep him up too much to be able to sign the paper with the blood of every Milan fan?) This horrible game raised more questions than answers. 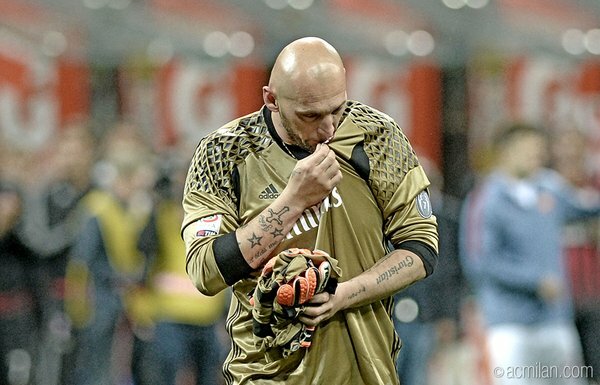 Except for one answer: Abbiati will not be our last man standing ever again. Not on the pitch, not in the dressing room, not wearing his deserved armband, not to face angry Curva Sud fans for us. Sadly, more than everything else at the club right now, for me, his final bows seemed like our end of days.